It seems that every year there is a kitchen gadget of some sort near the top of my Christmas list. I love to cook and any device that is going to make things easier for me in the kitchen is a plus. This is why I was thrilled to be able to review the Rotato Express from Starfrit. What is the Rotato Express? It is a one touch instant vegetable peeler. It instantly peels fruits and vegetables with no effort from you. Using this unit to peel your foods cuts down on waste that results from manual peeling, which is great for me as I generally peel about half the potato off when I do it myself. Using this hands free peeler will save you time in the kitchen, I can do prep work while it peels potatoes for me. It will peel all sorts of veggies and fruits like potatoes, turnips, apples, pears, peaches, and more. The unit comes with two replacement blades stored in the bottom and a hand thumb knife in the back, so you can easily deal with blemishes on your potatoes. The three blades included with the Rotato Express will allow you to peel about 100lbs. of potatoes! That is quite a deal. Plus, it comes from Starfrit a quality brand I know and trust. I tell you, this handy gadget really does cut down on meal prep time. When making mashed potatoes for 18 people, I was sure glad to have it around. It is a great addition to my kitchen and I am very glad to have it. I really hate peeling things, so this is a great product for our home. Now, would you like to have one of your own? I have a Rotato Express to give one lucky reader. All you have to do is head over to Starfrit and look around a bit. Then come back here and leave a comment telling me which one of their products you would love to have. This is mandatory for entry. Deadline to enter is 12/06/09 at 11:59pm CST. Good luck! The Rotato Express would be at the top of my list too. I've seen peelers, but not one that is automatic--totally cool! I would love to get this:Starfrit Easy Mandoline.I like very thin tomato slices in my sub. The Easy Mandoline would be another item I'd love to have in my kitchen. I could use this with a house full of seven.Thank you for having a contest! I also signed up to be an e-mail subscriber, thanks! I could really use the Starfrit Eco Breakfast Pan. I would also like the Supreme Slicer Set. I can use the Silicone Tongs with Locking System. The rotato will be a present for a friend who cooks for a big family. Thanks for the contest. 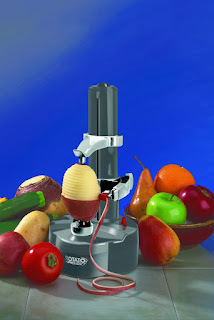 I like the starfrit apple pro peeler!! Thanks for the chance. The Rotato Express would be my first choice, I hate peeling potatoes! I also like the Starfrit Electronic Kitchen Scale. Thanks for the chance to win! I also like their Securimax Auto Can Opener. I need a new one! Enameled Cast Iron casserole with lid I love the red color. I would love to have the Frankkut Folding Chopping Board. I have limited space and this would be great! I love the versatility of Starfrit Easy Mandoline. I Like The Manual meat grinder. I like the Garlic Genius. I am a feed subscriber. I love the rotato. Thanks for the great giveaway! I like the Supreme Slicer Set. The Starfrit Easy Manoline is something I would like to have. Can you ever have too many Kitchen gadgets??? I would like the Starfrit Eco Breakfast Pan. I'd like to have the Eco Breakfast Pan. I'd love to have a 5" Mini-Griddle. I'd love to have the Enameled Cast Iron casserole with lid. I could really use the Quick Fix Silicone Spatulas in my kitchen! Those look pretty neat! Christina - xristya@rock.com - I'd love to have The Easy Mandoline in my kitchen! I love the electronic wall scale, it'd be great to save space in my kitchen! I'd love the STARFRIT potato chipper. I like the Starflit Potato chipper. I just started a garden so I would pick the Garden Solar Lights. I would love to have the Enameled Cast Iron casserole with lid. Thanks for the giveaway! I'd love to have the Electronic Wall Kitchen Scale. The Rotato would've come in handy for Thanksgiving! I'd also love to have the cheese grater! I would like the Securimax Auto Can Opener. I love the Starfrit Easy Mandolin! My other item would be the Starfrit Easy Mandolin. i like the arc 42 fry pan! I'd love the Apple Pro Peeler, thanks! I'd love the Mightigrip Jar 0pener! Oh I'd love to have this product I have the Apple Peeler Pro and it is great for peeling apples for baking - I think I'd also like to have the La Forge Elite Frying Pan. The Potato chipper looks very nice!